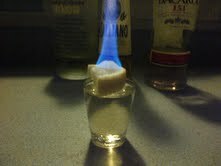 Not your typical Lemon Drop shot because this adds a lot of power to the punch! Enjoy! The float of 151 makes it turn up a couple notches and VERY FLAMMABLE!